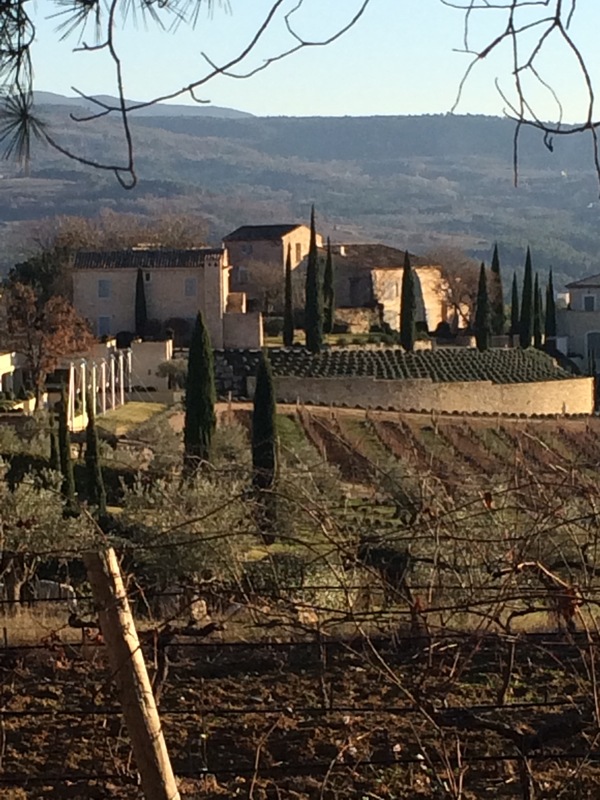 I’ve mentioned before that Winter is a great time to visit Provence – of course it can be very cold, thanks to the clear night skies and subsequent frosts, but the days can be stunning with bright blue skies, little or no breeze and the wonderful light that cheers you up in the depth of winter. 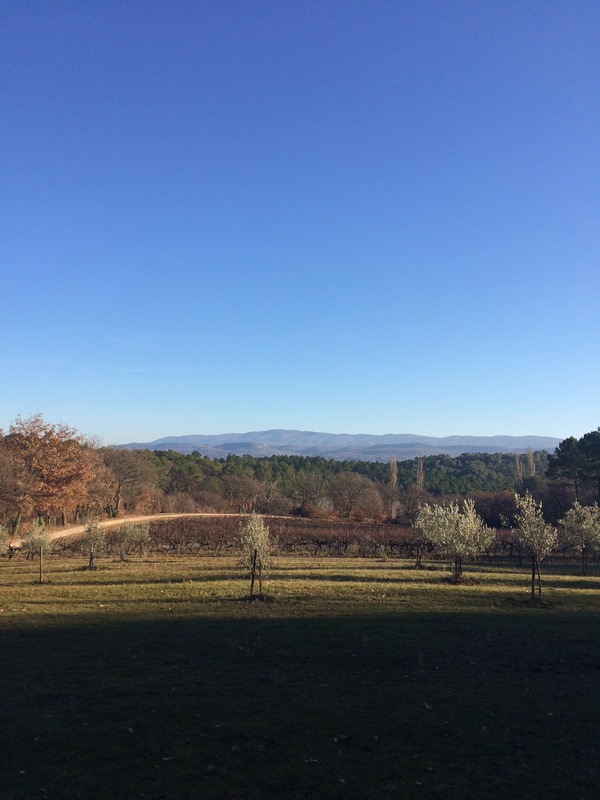 A winter’s day at Saint-Saturnin – just look at the sky!! 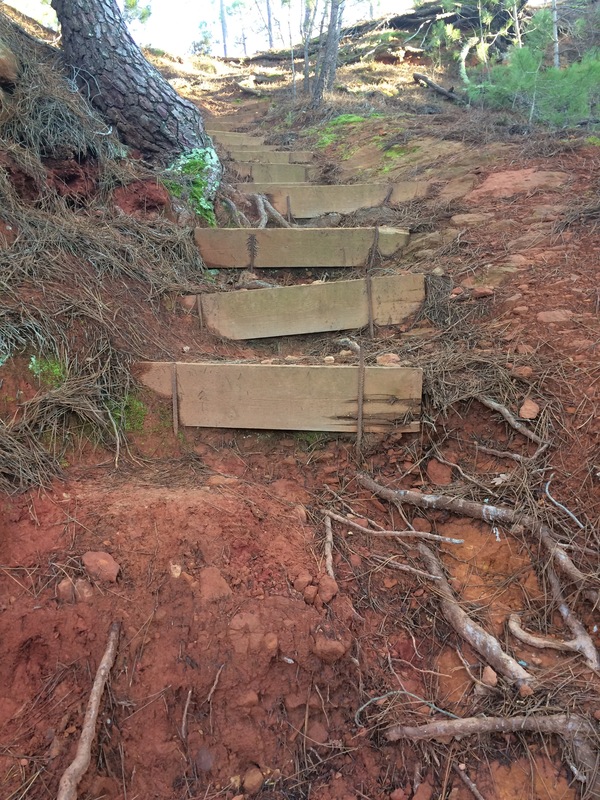 It’s also a great time to explore some of the many footpaths that riddle the area, which are often out of bounds in the height of the summer due to the increased fire-risk. Also we’ve found that hiking around the area in summer is just too hot for us – when we’re out cycling there is always a degree of breeze (very light for me as I really don’t go very fast), which tends to keep you slightly cooler, but when we walk we tend to get very hot and sticky very quickly, which means it isn’t always a pleasant daytime experience. In the summer we tend to save a walk until the later part of the evening, when the sun has lost its heat and the ground is just radiating a gentle warmth. So winter is when we tend to put on our boots and head off into the woodlands and find new places to explore. 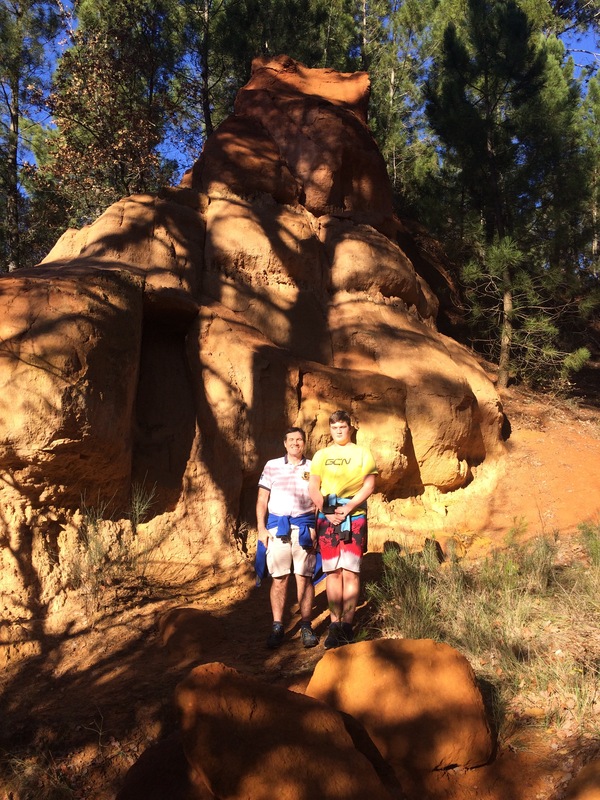 We do though have favourites and one of these is the wonderful circular route that takes you from a hamlet near Le Pont Julien, up an ochre trail into Roussillon then back round past the Conservatoire Des Ochres and through the vineyards of the wonderful La Coquillade Hotel. 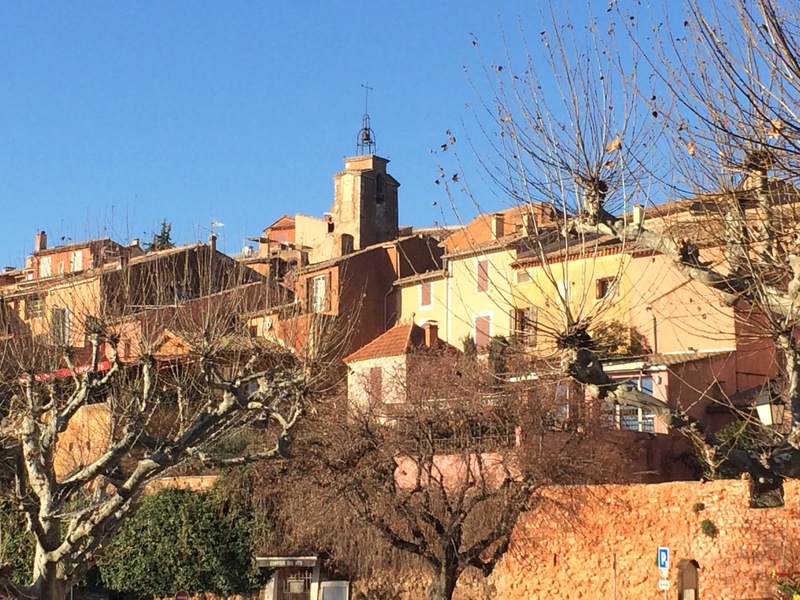 For me this walk has everything – quiet paths, beautiful colours, ever changing views & of course the chance to stop (half-way) for a nice coffee in the beautiful, colourful village of Roussillon. 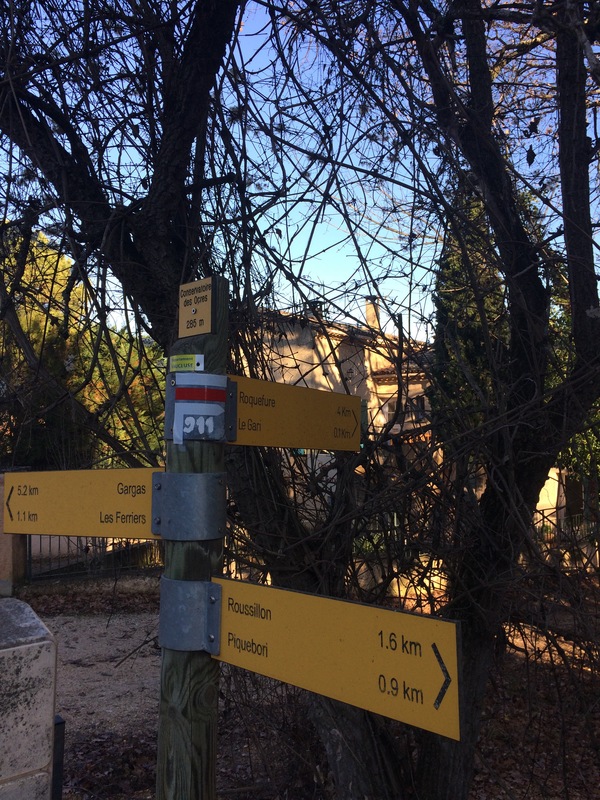 To start the walk, park in the small carpark in the centre of Les Huguets (a small hamlet found on the left as you take the road from Le Pont Julien towards Roussillon). From here walk up the main road towards Roussillon for about 200 metres, before taking the small unmade road that forks to the right behind the recently renovated house with pretty ‘Lavender’ shutters. 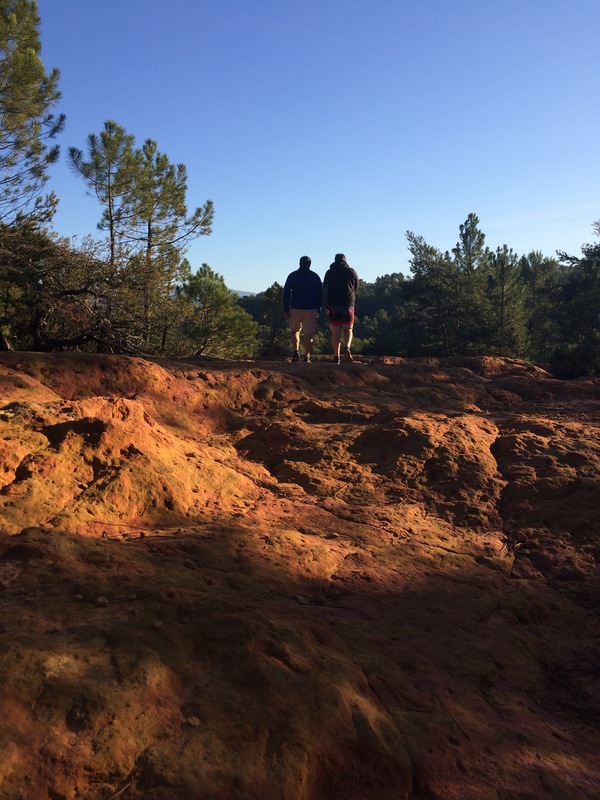 Once on this trail you climb gently through scrub-oaks and pines along an easy trail that is edged with the wonderful yellow, orange and red ochre-laden soils that come to mind when you think of Roussillon. As you walk up through the woodland you catch glimpses of views back towards the valley and beyond, which are just beautiful, coupled with the sight of local vineyards, which at this time of year look so dead that it is hard to imagine that they are capable of producing grapes in the coming season. 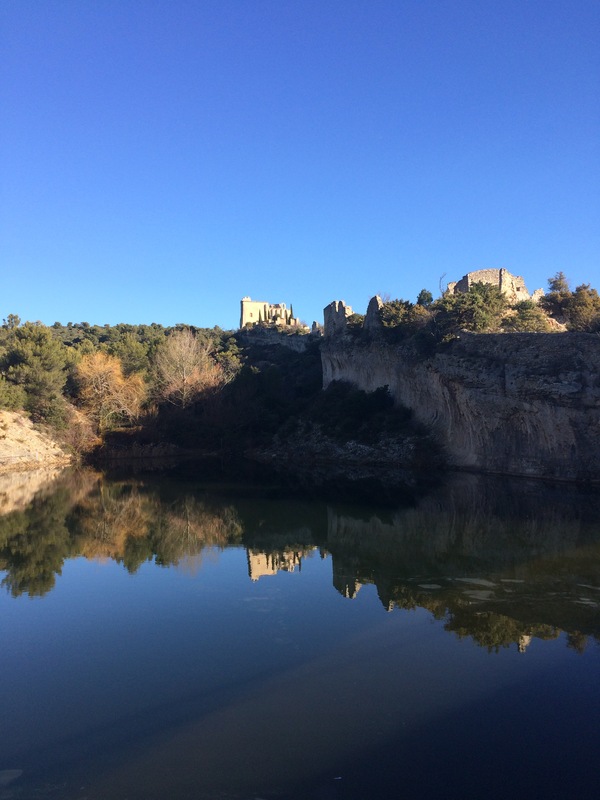 After about a mile you reach a noticeable right-hand bend in the trail with a house on the corner and just past this house you leave the unmade road and take a trail, which continues through the garrigue across rocks and on towards Roussillon. The trail here is marked by yellow paint on the trees and rocks, which keep you on track and heading in the right direction. After the rocky outcrop the path changes and you find yourself walking along an earthy trail where the soil becomes a beautiful dark red as it takes you further up the hill towards the village. Eventually you’ll see a mark on a tree showing the trail turning left. 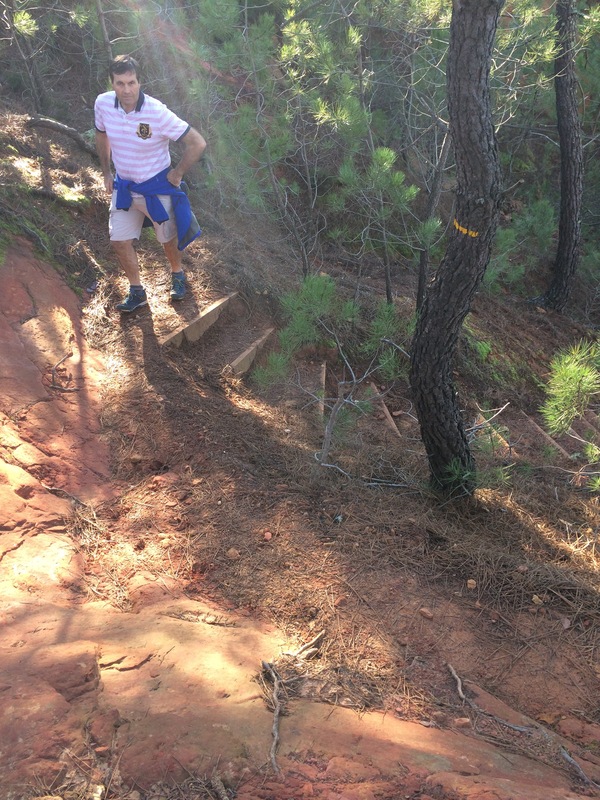 Here the trail drops quite steeply down some uneven steps, some of which have long-since disappeared…..
Take it carefully down the steps…..
……….back down to the road, where you turn right and walk up into the pretty village for a coffee-stop & a chance to sit down before continuing. To continue, follow the same road back out of the village, but continue straight on (rather than turning right at the roundabout to head back down to Le Pont Julien). About 200 metres further on you’ll see the Stade Municipal on the right, turn off here and follow the road, bearing left when you reach the fork in the path. 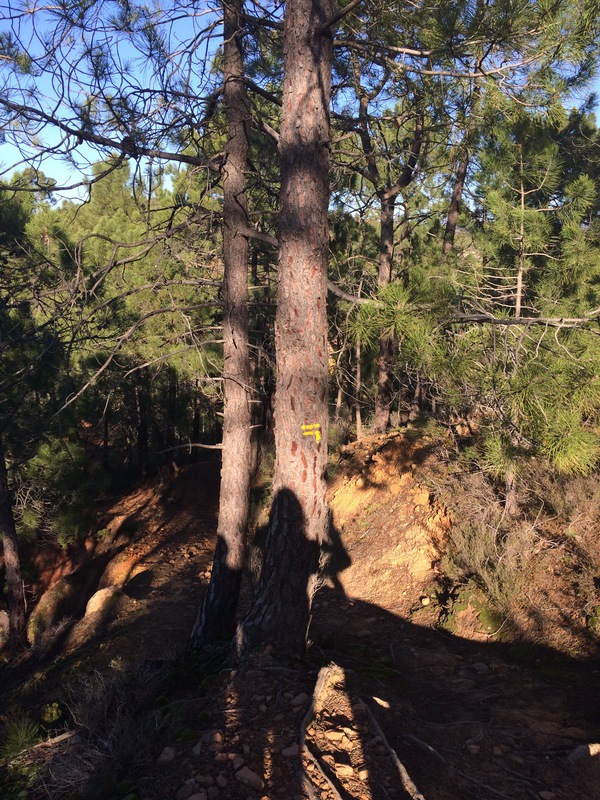 This trail takes you through the woodland to the Conservatoire Des Ocres http://okhra.com , a great place to visit to find out more about the industry and products that are made locally from its unique, richly coloured soils. Just past the buildings with their bright shutters follow the trail (marked with the yellow fingerpost) that takes you off to the right, past some houses and on towards the ancient ochre quarries. 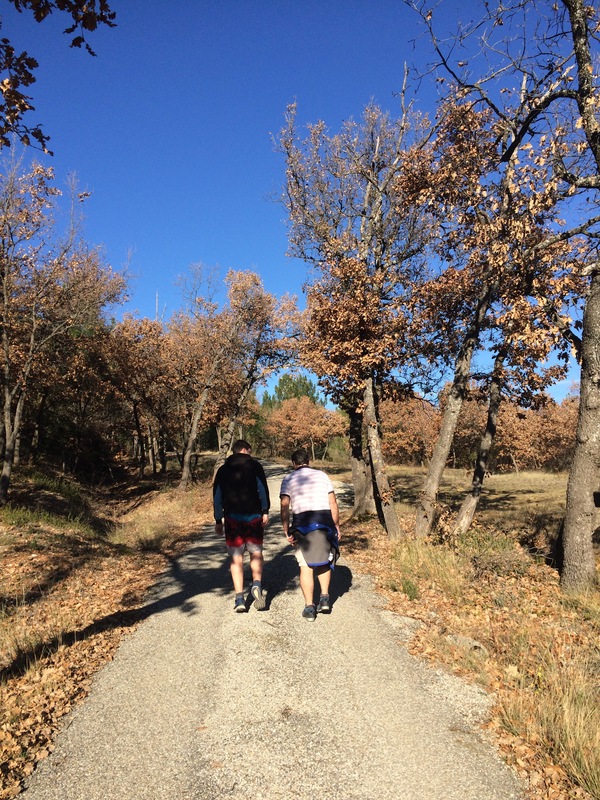 Once again you walk along an unmade track through woodland, (following the signs towards La Coquillade), which at the time we walked there looked as if it had been attacked by a group of small bull-dozers – the tell-tale sign of the local Sanglier population. When you emerge from the woodland you find yourself in the stunning old quarries, where the rocks undulate gently, their colours subtly changed by years of exposure to the sun and what appears to be lichens growing on some of them. 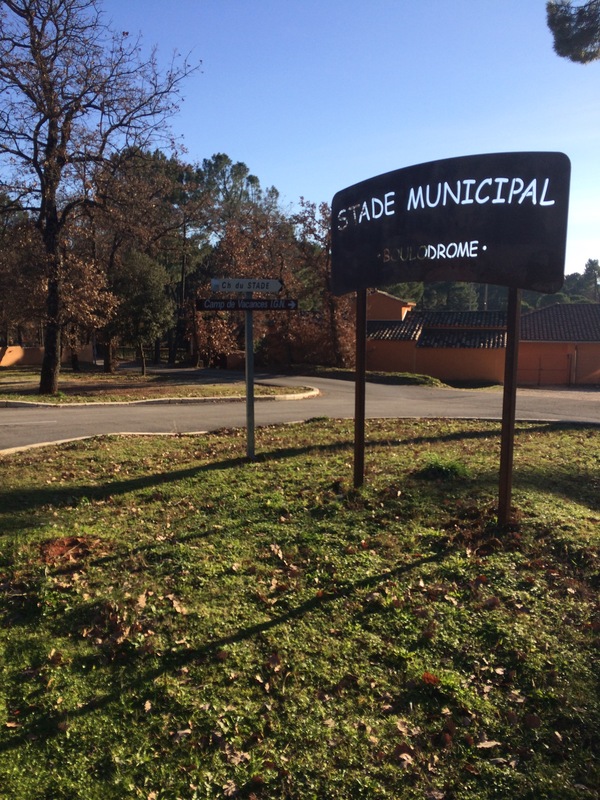 If you have avoided a coffee in Roussillon, or are looking for a perfect picnic-spot then I would suggest that this is it, as there are plenty of rocks that provide a comfortable place to sit and it is a lovely sunny place (even in winter) just to relax for a while. 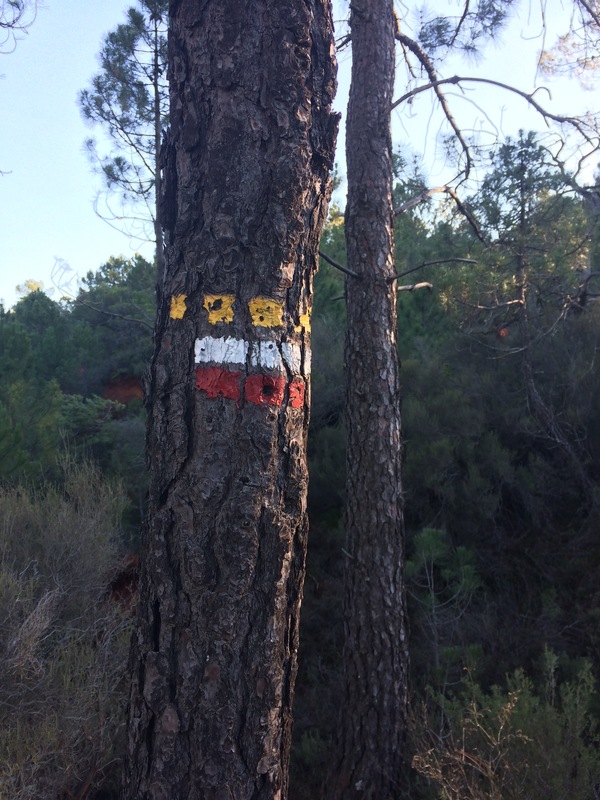 In the quarries walk along the right-hand side (although not too close to the edge, where there is quite a giddying drop) and again pick up the trail marked with yello, red and white stripes, which takes you up a rutted path through the scrub and woodland, emerging above the beautiful La Coquillade Hotel, where the view of the Luberon and the valley floor opens up again. Walking through the vines here you’ll notice signs that explain the different types of grape that are growing in each of the areas, which to be honest does rather encourage you to try the wines (if you need another excuse!). 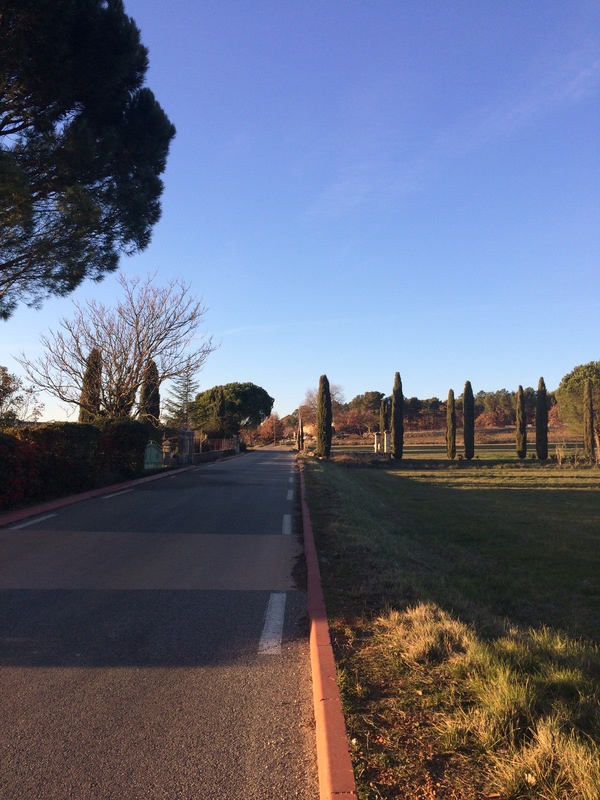 In the winter the Hotel is closed, so you dont feel as if you are intruding at all, making it a great time to wander through and down the main drive to the impressive entrance gates, where you turn right onto a small road that leads you back towards Les Huguets where you first started. The walk back along the road is lovely (keep to the right when you come to any forks in the road! 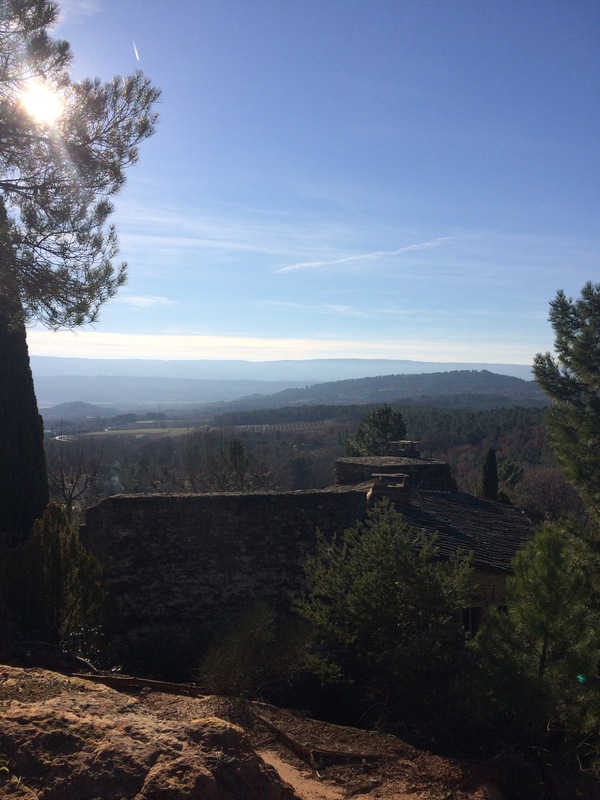 ), bordered either side with local vineyards and offering fantastic, expansive views across the Calavon Valley towards Bonnieux and Lacoste & on to the Petit-Luberon. Another mile along this road you will arrive back at you car in Les Huguets. The walk (with stops) takes us about 3 hours and we potter along chatting, stopping when we fancy and just taking our time to admire the view. 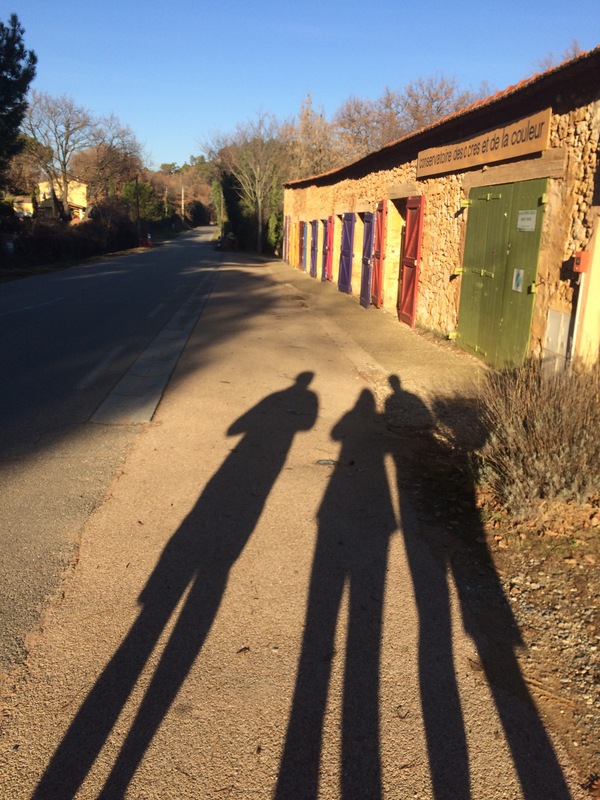 Doing the walk this way around means that the hill is out of the way at the start and there is the chance for a coffee in Roussillon, although of course you can easily start and end the walk there too, where there is plenty of parking. In winter it is a lovely way to pass a few hours and gives us a great excuse to just collapse with a glass of wine and a nice meal in front of the fire when we get home feeling exercised and happy! A perfect excuse for an evening in front of the fire! looks so very dry, even in December. Thanks for sharing!